Serena Williams is thought o be among the best women tennis players in the world and yet again she proved it by her victory in Wimbledon. 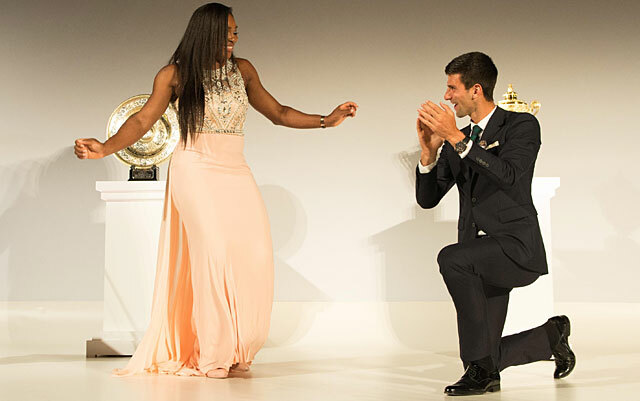 The newly crowned tennis player Serena and Djokovic breath new life to an old tradition while hitting the dance floor at the Wimbledon Champions’ Ball on Sunday. At the Grand Slam tournament’s annual champions’ dinner, tennis stars dance together to ‘Night Fever,’ Bee Gees’ disco hit from the 1977 movie Saturday Night Fever. After defeating Roger Federer in four riveting sets in Sunday’s final, the men’s champion said he was going to ask Serena to dance. Djokovic said he originally planned for a waltz, but they ended up performing something straight out of Saturday Night Fever instead. The USA Today reported dancing at the ball had been a tradition at Wimbledon, but when the ceremony moved to a smaller space in 1977, the practice was scuttled and never officially brought back. The two Wimbledon champions have won five of the six Grand Slam singles titles in 2015. Tennis lovers praised the revival of tradition and hailed the winners.